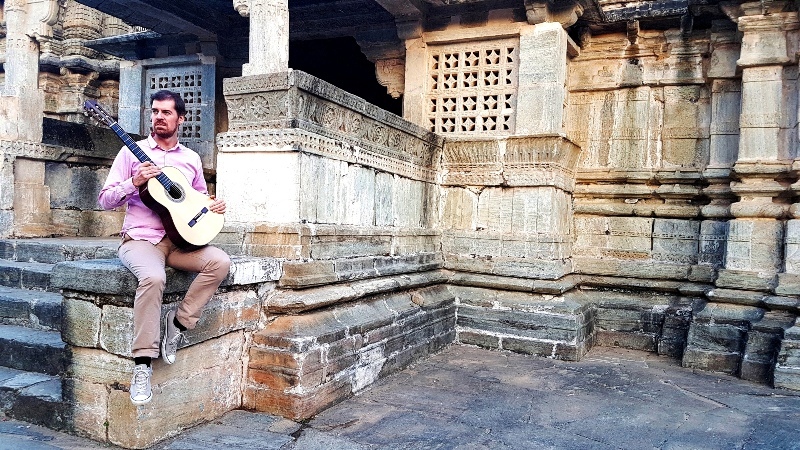 Virtuoso musician Simon Thacker appears on Friday 9th November at Sage Gateshead for GemArts Riverside Ragas concert series launching new album Trikala by his group Simon Thacker’s Svara-Kanti. The guitarist, composer and serial YouTube trawler names his 5 favourite female led songs discovered on YouTube. Sometimes when I’m discovering music on YouTube I’m doing so just for the sake of it, but a lot of times I’m actually looking for something specific. When I was panning the new Trikala album I was looking for the right song for our singer Japjit Kaur, for my group in general and for me as a composer. Basically, if a song is absolute perfection then there’s no point in touching it. For example there’s a song by Surinder Kaur, probably the greatest Punjabi folk singer ever, called “ayena akhian ch tu vasda”, but really I can’t hear how to improve it, even though I love the song. I don’t want to do a cover. I want to totally reimagine any song I approach and bring something radically new, reinvent it, give it new meaning. Trikala has 3 Punjabi songs and the last album also had 3 so a picture is building of my vision for the tradition. I love Ajj Koi Saade Vehre and this performance (Surinder with her sister Parkash) in particular (it is a famous Punjabi wedding song) but straight away I could hear how I could transform it. This is a Meera bhajan, a devotional song attributed to the 16th century female mystic poet Meera. This version is actually from a Meera film biopic soundtrack by Ravi Shankar, a not so well known part of his work but a fantastic album of great arrangements. The singer is Vani Jairam, best known as a playback (film) singer in South India. She brings something very special. Love the vibraphone too. I actually transcribed the whole thing a few years ago, all the instruments, not to be played but just to try to understand what made it so great. This is a Pashto film song which I know very little about, other than that Naveeta Khan was a well known film singer of the ‘70s and 80’s from Rawalpindi (Pakistani Punjab). It is a great melody even though the video is compressed to death. The sound 3 minutes in seems to distort, but it actually sounds awesome, totally in keeping with the emotion of the song. I have periods of time now and again where I listen to loads of Pashto songs from this era and before. Parisa (Fātemeh Vā’ezi) is one of the greatest ever Persian classical singers. This is a very simple example of her art, but again I just love the directness of the melody, and its cyclical nature. Her singing at this time was particularly phenomenal but unfortunately she was prevented from singing in public after the revolution in Iran in 1979, not touring again until many years later. I’d like to get my hands on more of her recordings from this period. And to work with her now! Tina Sani is a Pakistani classical singer and this is from Coke Studio, a television series in both Pakistan and India, that often puts classical and folk performers in big produced “fusion” settings. This one just works, her interpretation is so from the heart and it has a beautifully natural build up and a great unresolved ending. Simon Thacker plays Sage Gateshead on Friday 9th November as part of GemArts Riverside Ragas concert series.